Somprasong and Ma, the first two refugee trainees to enrol in the Bread and Butter Project, are graduating this month after a year-long program of kneading, moulding and baking bread. 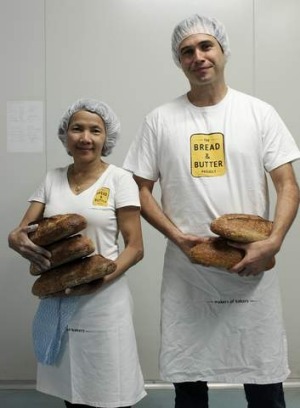 A social enterprise co-founded by Bourke Street Bakery owners Paul Allam and David McGuinness, the Bread and Butter Project empowers members of Sydney's refugee community by providing a paid, 12-month training program in baking. As well as learning the ins and outs of the job, the trainees attend English lessons with the help of external volunteers. Somprasong, an accountant in her country of origin, has loved her baking experience. ''When I was an accountant, I would have lots of work left at the end of each day,'' she says. ''It would pile up on my desk and I would stress about it at night. Now, with baking, everything is packed down at the end of a shift and I can go home and relax." There are seven trainees at the Bread and Butter Project, which staggers the enrolment process for new participants. The program is TAFE accredited and graduates receive a Certificate II in Retail Baking Assistance. Somprasong and Ma have been offered full-time positions at the Bread and Butter Project's factory in Marrickville, which they have both accepted. ''I can't wait to be able to use the oven,'' Ma says. The pair will also mentor trainees. The Bread and Butter Project not only helps refugees acquire skills and settle in their new country, but it also produces some of the best baked goods in town. The products, which include sourdough loaves, paninis and flatbreads, have been selling well. ''It's heartening for the trainees to see they've been doing something that's been so well received all over Sydney,'' Allam says. He was speaking at this month's Sydney Morning Herald Pyrmont Growers' Market, where the Bread and Butter Project sold its first loaf almost a year ago. Although demand for the bread has been greater than the supply, the trainees ''are the No. 1 priority'', says the project's general manager, Brett Jordan. ''We will always temper the business growth to make sure the trainees are being properly trained, and are never coming in just to work.'' All profits from bread sales are reinvested into the project. The project's bread can be found at more than 100 locations in Sydney, including David Jones. Correction: The number of trainees in the program was listed as 12 in the original version of this story. The correct figure is seven. The Bread and Butter Project aims to increase this to 12 per year in the future. This has been amended in the text.